For PlayStation 3 only, Kingdom Hearts HD 1.5 Remix—yes, that's the full name—will be coming to the U.S. this fall, Square Enix said today. 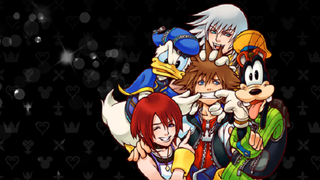 Fully remastered in HD, KINGDOM HEARTS HD 1.5 ReMIX is a compilation of the critically acclaimed KINGDOM HEARTS FINAL MIX, previously exclusive to the Japanese market, and KINGDOM HEARTS Re:Chain of Memories. In addition, the two-in-one-disc package will feature HD cinematic story videos from KINGDOM HEARTS 358/2 Days, enhanced gameplay mechanics and PlayStation 3 system trophies. Still no news on Kingdom Hearts 3, or as Square will probably call it, Kingdom Hearts 14%xzqorb&*(*&)! ( Memories.